Today, let’s fly all the way to Berlin, Germany – where there’s so much to be explored and discovered, but we are obviously focusing on the food, beer, and delicious desserts Berliners enjoy on a daily basis. Check out my Foodie Travel Guide to Berlin, Germany! When we were planning our Europe trip last year, we decided on cities by way of our travels. Meaning if we were getting from A to C and were going through B, it would make sense to add B to the list of cities to visit and thus why we added Berlin on our month-long food tour. It’s taken me a while to get this post up due to…life in general, but I’m excited to finally share it with everyone! Berlin was an incredible city to eat our way through, but also learn so much about its history, people, and culture. This Foodie Travel Guide to Berlin is a great start for planning a culinary-focused trip and I hope your travels take you to this magnificent city in 2018! When planning our trip (which would take us to seven European cities in a month) we decided to interchangeably stay at hotels and Airbnbs, giving us a little diversity in our accommodations and helping us stick to a budget. For Berlin, we booked an Airbnb – specifically this Designer Loft in Berlin. The apartment is both close to all the great locations in Berlin, as well as quiet near a lake (10mins) and public transport (Tram) is within 5 minutes walk. Our host was hospitable and the place was incredibly clean and tidy, with everything we could ever need during our stay. Whenever we plan travel, it goes like this: book hotel and book food tours. The two most important things for us are basically where we are going to rest and what walking for tours can we take while there. Throughout Europe there’s a company called Secret Food Tours and we have found that their tours are incredible in each country – they are consistently packed with not only great food, but knowledgable tour guides as well. This food tour of East Berlin was about 3.5 hours long and led by local guide Karl, who was incredibly knowledgable. Not only did we discover local German food, but explore the Turkish contributions made to the region over 50 years ago. Street food culture, beer halls, and more – it was such a fun tour and a quick way to get to the know the area. Of course, we walked down historical streets and saw the famous Berlin Wall and East Side Gallery. We tasted a great variety of foods and left the tour stuffed and having learned so much of the history of Berlin! 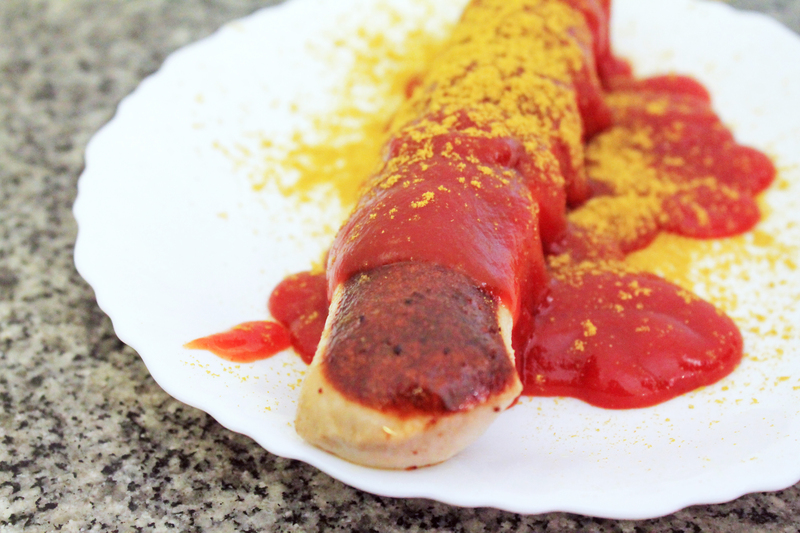 Above, the classic currywurst, a fast food dish of German origin consisting of steamed, then fried bratwurst typically cut into slices and seasoned with curry ketchup, a sauce based on spiced ketchup or tomato paste, itself topped with curry powder. Interesting, but delicious as a quick snack on the go. Every Tuesday and Friday, Maybachufer Strasse, a street running alongside the Landwehrkanal (Landwehr Canal) in Berlin’s Neukölln neighborhood, comes alive with voices, aromas, and the bustle of the city’s biggest Turkish market, the Türkenmarkt. 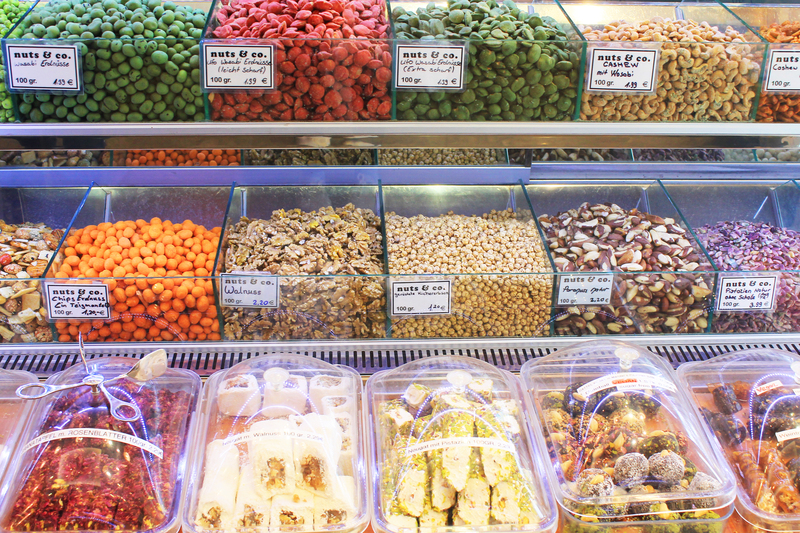 We stumbled upon it one day and could not believe out luck – nothing we love more than an outdoor food market, and what joy that we could experience authentic Turkish foods while being in Berlin! I remember the sights and sounds of the market vividly, as we made our way through the stalls, purchasing odds and ends to take back to the Airbnb. Rosewater honey soaked “lokmas” (fried dough) sold for 1 euro a piece, delivered in a thin plastic bag, made my sweet tooth the happiest. If you’re in Berlin on a Tuesday or Friday, make sure to explore the market! Read more about the vendors here – great post on Culinary Backstreets about this incredible market. 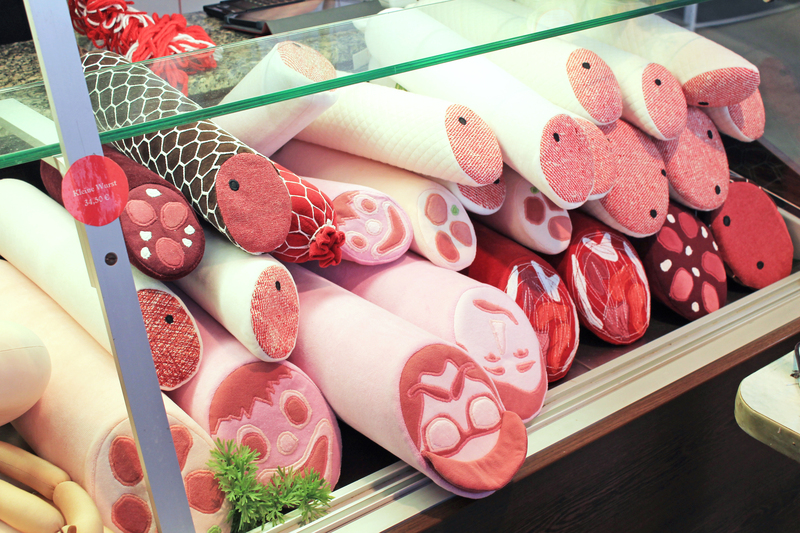 Germany is obviously known for its love of all things meat, so it was surprising to fine this fun new concept – a textile butcher shop where nothing is edible and everything is super soft! Aufschnitt Textile Butchers is just that, where you’ll find a “meat case” filled with handcrafted cushions, toys, and more, all made to look like meats, charcuterie, and sausages. This is the perfect spot to pick up a souvenir! Up next on things you need to do while in Berlin is a bike tour – a Berlin City Bike Tour to be exact! It is hands down the best way to learn about the history of this city in an interesting and interactive way. The themes discussed during the tour include Berlin’s founding, Prussian Berlin, The rise of Hitler and the Nazi years, wartime Berlin, post-war Berlin and the division of Germany, and the rise and fall of the Berlin Wall. Even if you aren’t in the best shape of your life, you can definitely do this tour as most (all maybe) of Berlin is flat and easy to bike, plus the city is well equipped with bicycle paths and the culture is very respecting of both pedestrians and bikers. You get to choose between a comfortable cruiser- or city-style bike – I obviously went for the cruiser as did most of our tour group, since they are easier to ride in my opinion. Just to get a sense of the places we stopped – here’s a list below. Most places are great for photos and our tour guide was exceptional, a history buff that knew everything there was to know about the city’s history. Not only was the tour amazing, but since it is about a 5 hour tour, halfway through the tour we biked to a traditional beer garden and had lunch (not included and we had to have cash, since they don’t take credit or debit cards) and it was such a delicious experience, I’d go on the bike tour again just for the lunch! Above, my starts – a lentil vegetable stew with a freshly baked poppyseed roll. The soup was just so flavorful and delicious, I could have stopped there but I was starving, so of course had to order the pork cutlet with German potato salad and a little greens. Why is it Germans cook pork so well and when can I go back for another cutlet?! And for dessert, apple streusel. Between the way German cook pork and the way they bake desserts, I feel like Berlin and I would get along swell if I lived there. 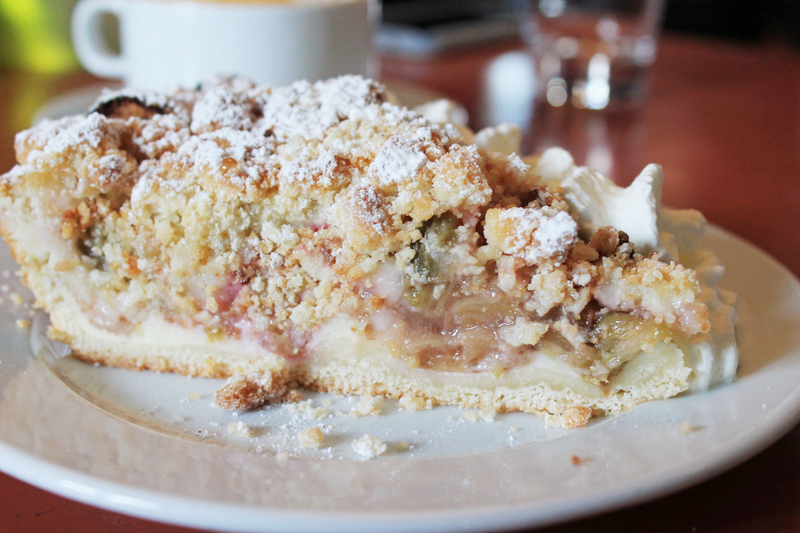 Accompanied by a strong black coffee, this slightly sweet (Germans are known for their desserts, but also know not to over do it with the sugar) apple dessert, with a layer of pie crust on the bottom, perfectly stewed apples and rhubarb, and topped with a crumble topping barely sprinkled with powdered sugar had be dreaming of moving to Berlin. The plain, three- story townhouse along the medieval wall was built in the second part of the 13th century. The first documented mention of the present restaurant building dates from the year 1561. In 1621 a former equestrian servant of the elector at the time laid the foundation of the present restaurant with the opening of gin mill- „Biedermeierstübchen“ . In the 1920s the restaurant established itself increasingly and the visits of famous figures like Henry Porten, Charlie Chaplin, Heinrich Zille, Clara Zetkin, Wilhelm Raabe and Otto Nagel became more frequent. In 1924, after the construction of the courthouse in the nearby Littenstraße, the restaurant got its present name. After World War II the building had been restored true to original and in 1963 it was reopened. To date the restaurant could defy the influences of more than four centuries and survive for the satisfaction of the guests. The menu at the restaurant was precise and to the point. Start with the freshly baked bread, not served with butter, but with lard with bits of crackling. Sounds odd, but it was SO delicious as the fat melts onto the warm bread. For our entrees, I ordered the “Verhandlungspause”, which translates to meatballs, capers, and parsley mashed potatoes (see above). 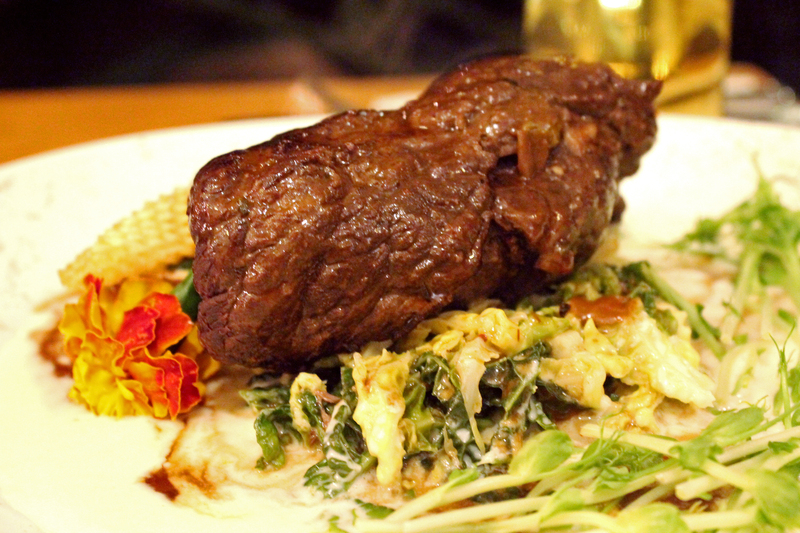 My husband ordered the “Urteilsbergrundung”, a stuffed beef roulade with bone marrow and Savoy cabbage. Both dishes were incredibly hearty, as German cuisine is know for its large, meat-focused entrees. The average annual meat consumption is 130 pounds per person, which seems like a lot (it actually is, ha!) but when your three meals are based around meats, it’s not that hard to reach that average! p.s. If you’re vegan or plant-based, don’t be discouraged! Berlin has some incredible vegetarian and vegan restaurants as well! It’s incredible to see both ends of the spectrum – so vegan or carnivore, eat up. In conclusion, if you’re planning on visiting Germany or any surrounding country, I definitely suggest a few days in Berlin. Not only is the food incredible, but the city itself is packed with history, culture, and great people. Everyone we met in Berlin, from chefs to tour guides, was kind and helpful. It’s an easy city to walk, so you don’t really need a car to get around. Get those steps in – or rent a bicycle! 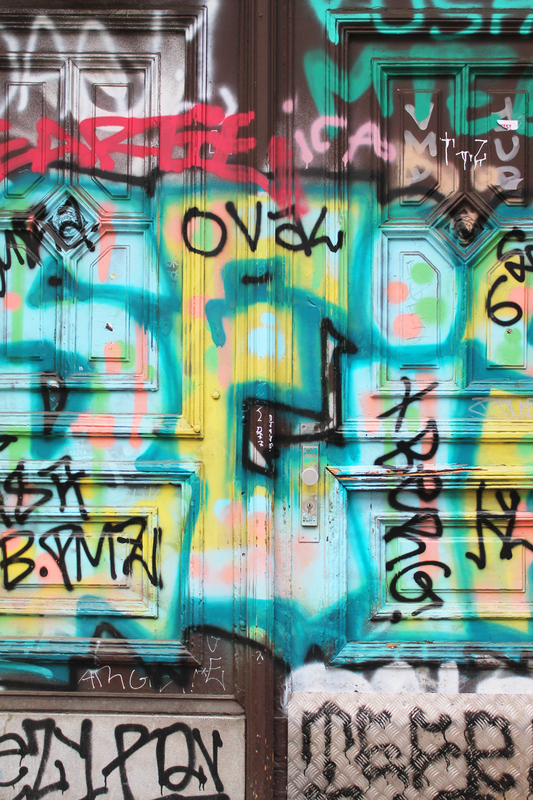 Either way, a visit to Berlin for the food lovers and history buffs, is a must. 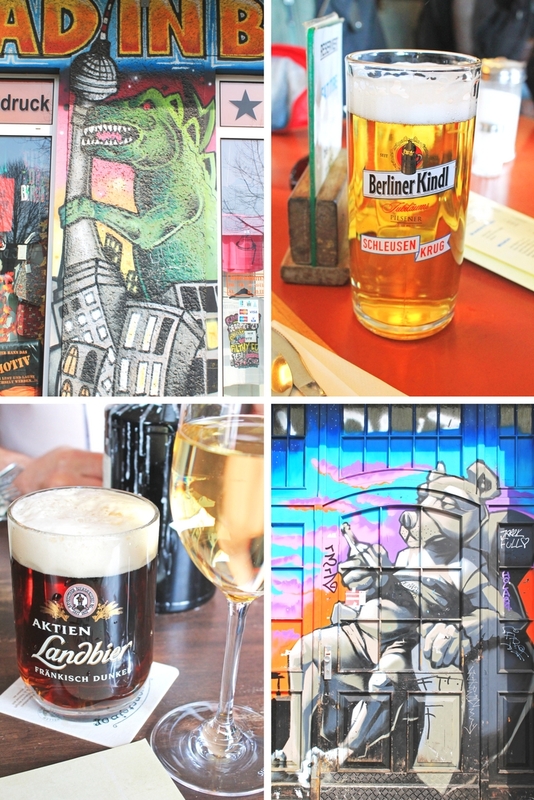 Hope you enjoyed my Foodie Travel Guide to Berlin! I prefer Hamburg than Berlin when it comes to food. Though never been to Berlin, hoping to check in these places next months. Thanks for the detailed guide for Foodie Fond!